Honda Accord Infographic PR Banner at an eventInfoNewt designed this infographic PR banner for Honda America as part of their promotion activities supporting the release of the new 2013 Honda Accord. These 9ft banners were on display at PR events in cities all over the country through August and September. This is a great example of getting more ROI value out of one design project. In addition to being used as banners at the events, both a printed version and an electronic version on USB drives were included in the PR kit handed out to members of the press that attended the events. Finally, the infographic was released online to appeal to the broader consumer audience. At InfoNewt, we focus on two levels of an infographic design. Most of the audience will only spend five seconds or less reading the infographic, and the information that a reader can walk away with in that time is called the top level. We identify what we call the "Key Message" with the client up front when we begin a design project, because we want the infographic to communicate that message in the top level of the design. The second level of the design is the rich, detailed information and data visualizations that support the Key Message. A smaller portion of the audience will take the additional time to absorb and understand that deeper level of detail, but they are also paying very close attention and will comment about any mistakes made in the designs. The Key Message of this particular design is that Honda has been building Accords in the U.S. for 30 years. In fact, they've been building them at the same manufacturing plant in Marysville, OH for all 30 years. The design communicates this message very quickly to the audience, and all of the additional technical specifications of the different Accord models through the years is second level data. The color waterfall of the available exterior colors for every model year is a fun, engaging design element that initially attracts most viewers, but was especially challenging. 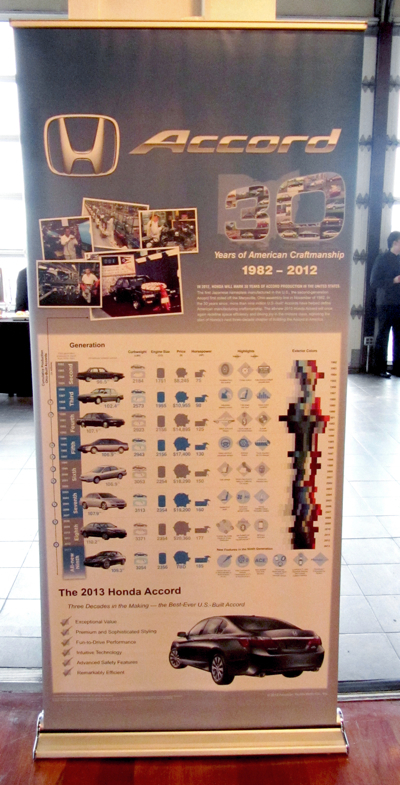 The team at Honda had to dig back into their physical, historical archives over a period of a few weeks to gather the old model specifications and take high-resolution pictures of the old brochures. This was especially challenging because none of the old materials have been electronically archived or were allowed to leave the building. There is a lot of detail in the second level of the design. The 2013 model of the Accord is the ninth major redesign of the car, and that gave us the opportunity to focus the timeline on the changes made with each major redesign. The design highlights some of the most significant features of each model design, and even distinguishes between standard and optionally available elements. CD player launched in the fourth generation, side airbags launched in the sixth generation, etc. Although most of the data is represented with icons, we found that actual photos of each model design made them quick and easy to recognize. The timeline starts with the second generation because that was the first model built in the U.S. and reinforces the Key Message of the overall design. Wheelbase is shown as a dimensional arrow in each photo, which puts the data into context and performs the dual purpose of also visually explaining what the wheelbase dimension is to any readers that don't already understand. Down the left side of the design is an additional, subtle data visualization that places each 1 million cumulative Accords produced on the timeline. This leads up to the current major milestone of 9 million Accords produced in the U.S. that was reached in 2012.